A monobloc version of “Nuovo Milano” cutlery! Identical shape but a more affordable price. 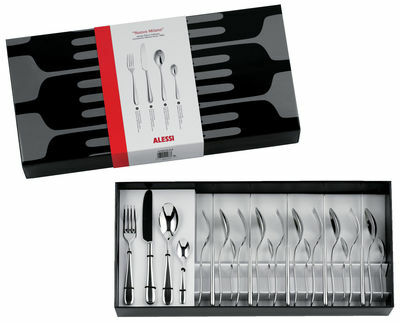 This set contains 24 pieces of cutlery (for 6 people): 6 soup spoons, 6 forks, 6 knifes and 6 coffee spoons, all wrapped in an elegant box. A beautiful gift to give or to treat yourself. “Nuovo Milano” cutlery service was created by Ettore Sottsass in collaboration with Italian chef Alberto Gozzi. This cutlery has received many awards (for example the Compasso d’Oro award in 1989) and is considered to be a classic now. It features beautiful clean and elegant lines of high quality stainless steel.